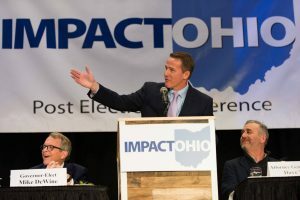 Lieutenant Governor Jon Husted will oversee the creation of InnovateOhio under the DeWine administration. This newly created state agency is tasked with bringing companies and jobs to Ohio through technological developments. InnovateOhio’s goal is to improve government efficiency and customer service in the public sector. Husted hopes that this program will streamline government processes and facilitate a shift from in-person to digital communication between citizens and government agencies. The agency will also train Ohio industrial workers in advanced technology and offer impactful certificate programs for adults looking to enter the workforce. Overall, the agency is tasked with attracting more skilled workers to the state of Ohio through technological development. The agency is working on establishing an InnovateOhio advisory council. This council will be comprised of Ohio-based tech and business leaders. Additionally, InnovateOhio is looking into creating a private/partnership which allows the private sector to update government data sharing and improve public service delivery. Blockchain is one of many technologies Ohioans can expect to see implemented across a variety of state agencies. SmartOhio Operating systems will also be used to more effectively share data amongst state departments. Another component of InnovateOhio is the Common Sense Initiative, a workforce transformation initiative which removes restrictive rules on employers. As midwestern states are competing to be technologically advanced, InnovateOhio hopes to bring technology to Ohio which will modernize state government, improve outcomes, and save money. Part of Governor DeWine’s statewide platform to improve innovation includes funding skills training in a variety of technological fields, such as robotics and coding. The administration also hopes to expand broadband internet access in low income communities. Those in the tech world are also hoping to see the removal of government barriers to innovation in the private sector. Technology continues to shape the economy we live in, and it is important to the DeWine-Husted administration that Ohio successfully adapts to these changes. The programs implemented by InnovateOhio will hopefully make state government a more attractive workplace for innovative young workers, attract new business and investment, and save tax dollars through a more efficient government.